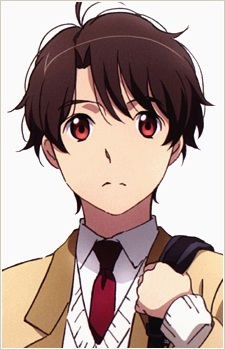 Inaho is a young boy of average height and short tousled black hair. His eyes hold a burgundy color and he has a blank gaze. He is seen in his high school standard uniform which consists of a white shirt, red tie and white sweater, along with a light brown blazer on the outside and black pants. His backpack is dark blue. Inaho is a calm, intelligent boy. Even at times of great distress, he calmly thinks of a way out. He is intuitive and not afraid to go on many different tactics to analyze the opponents and figure out the suitable strategy. Inaho's parents died sometime prior to the war and he lived alone with his sister. Waking up, cooking breakfast for his sister, he leaves for his school in Shinawara. He, along with his friends, attended the parade where the princess was killed by a missile attack. Shortly after, the Orbital Knights declared war on the Terrans and invaded Earth. Inaho's daily life was shattered because of the attack. After Slaine nearly kills him, it is discovered that part of Asseylum's powers that activate the Aldnoah Drive were transferred to him when he gave her mouth-to-mouth resuscitation. He now has a bionic eye and a processor specializing in prediction algorithms serving as his temporal cortex. However, it's soon revealed that his eye is slowly invading and taking over his brain whenever Inaho uses it, expanding over every time. In episode 10 of the second cour, it's revealed that the eye has expanded so much that it takes control of him when he falls unconscious. After this event, it's also shown that he can talk with his eye. At the end of second cour, Inaho decides to get his bionic eye removed since the war has ended and thus, he has no need for it. Instead, he starts wearing an eyepatch.